Volvo V60 Performance, Engine, Ride, Handling | What Car? 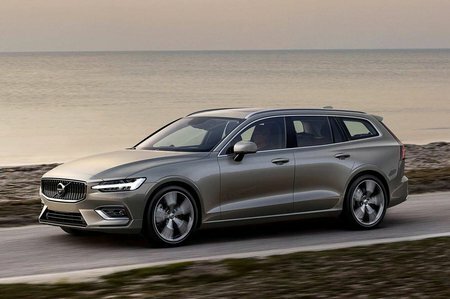 Right now, this latest V60 is available with three engines: two 2.0-litre diesels (the D3 model has 148bhp, while the D4 squeezes out 187bhp) and a 247bhp turbocharged petrol, badged T5. These will be joined by a plug-in petrol-electric hybrid later in 2019. The D4 covers the 0-62mph sprint in a claimed 7.9sec, which is competitive and sounds plenty, but the reality is that, at full chat, it doesn’t feel quite as nippy as the Mercedes C-Class C220d Estate and Audi A4 Avant 2.0 TDI 190. 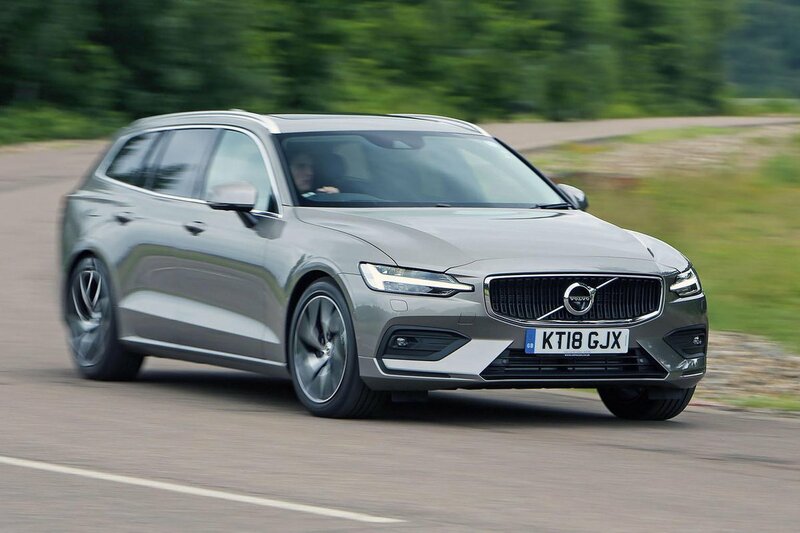 But, when you’re not trying to win drag races, you’ll find the pace it offers quite sufficient; indeed, the V60 can offers more than enough low to mid-range verve for effortlessly bumbling through town or plodding mile after mile up the motorway without any stress. Naturally, the D3 isn't as brisk as the more powerful D4, but it's still quick enough, getting up to motorway speeds without too much fuss and pulling from low in the rev range. Even so, given the small price premium and similar economy, we'd pick the D4. As for the T5, it's a fair bit faster than the D4 on paper, but needs working pretty hard if you're to notice its additional performance. We found the more muscular mid-range pull of the D4 suited the car better. Yet the V60 has an Achilles' heel: its eight-speed automatic gearbox. As with other Volvos, this tends to dither when you ask for a burst of acceleration – something that you have to factor into your driving technique if you don’t want to get caught short when pulling out of junctions or going for an overtake. If you fancy something more alert, and you can put up with changing your own gears, there’s always the alternative six-speed manual ’box. While this doesn’t have the most tactile of shifts, it has a reasonably short throw and is easy to slot into the correct gear. We just wish the clutch pedal had a bit more feel; it can be rather tricky to find the biting point. When it comes to four-cylinder diesel engines, nothing gets near to matching the hushed tones of the Audi A4, but the four-cylinder V60 D4 comes a commendable second. It’s certainly more vocal than the A4, particularly when you accelerate hard, but is never harsh and is far less grumbly than its C-Class and BMW 3 Series counterparts. If you want the most refined V60 experience, the smooth T5 petrol is your best bet. It even sounds pleasantly sporty when you're extracting maximum performance. Elsewhere, the A4 pips the V60 for hushed progress. Even though the versions we’ve tried had optional acoustic glass fitted, you can still hear more flutter from wind over the door mirrors than you would in the A4. Mind you, road and suspension noise are mostly well damped out, so the V60 is still a largely hushed experience for big-mile jaunts. The V60 strikes a happy balance with its ride – assuming you’ve got the right suspension box ticked. With standard suspension and 17in or 18in wheels (like you’d find on Momentum and Momentum Pro models respectively), the V60 is impressive. Body movements are tightly checked over gentle bumps – sleeping policemen or undulating dips and crest on country roads, for instance – so it won’t make your passengers ill, yet it still copes well when you strike something harsher, such as a sharp-edged pothole. However, opt for 19in wheels and adaptive suspension and you’ll find the V60’s character changes for the worse. Even in Comfort mode, the car fidgets over all but the smoothest of surfaces, while vertical movements over crests and compressions are far too sudden. Stick it in Dynamic mode and it’s far too firm for the majority of British roads. Like other Volvo models such as the XC40, R-Design trim gives you stiffer suspension that, on the V60, also drops the car's ride height. While you'd expect it to be the least comfortable of the bunch, its even tighter body control makes it perfectly bearable on most road surfaces, assuming you don't mind a firm edge to the ride. Indeed, if you crave 19in wheels, it's your best bet. 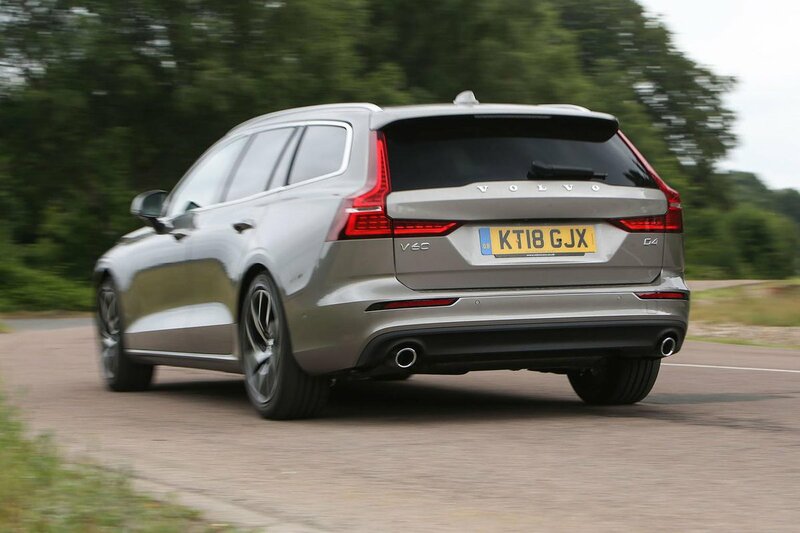 Further good news is that the V60 handles well on 18in and 19in wheels – and not just for a Volvo. Okay, it doesn't offer the pin-sharp dynamics and rear-wheel drive entertainment provided by a well-specced 3 Series Touring, but the front-wheel-drive V60 steers lightly in town and deftly on country lanes, and tracks assuredly straight on motorways. Meanwhile, its body stays planted and the tyres deliver good grip when you press on. Opt for 17in wheels and you’ll find the handling more wallowy; that’s the price you pay for the additional comfort that deeper tyre sidewalls provide. Alternatively, the stiffer R-Design setup reduces body roll and allows the V60 to turn in to corners more sharply, although the change isn't transformative. Four-wheel-drive versions of the regular V60 will also be available further down the line, and we've reviewed the rugged V60 Cross Country separately.